I cannot believe my littlest is 8 weeks old this evening! I knew how time travelled from previously having my eldest son but boy it sure does go fast. 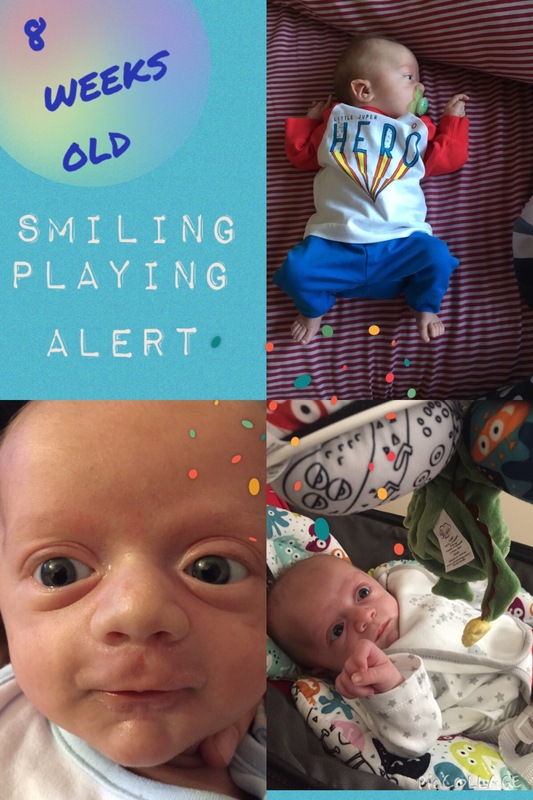 This week Jacob has come on a lot more in himself he is now smiling when I speak to him and even trying to play with the toys on his mamaroo which is a big achievement for him. Next week he has his first set of immunizations which I am absolutely dreading, and then the day after he has his genetic testing appointment so a lot of nasty needles for the poor mite. I can’t comment on how much he weighs as he hasn’t been weighed since last Tuesday where he totalled at 7lb4 1/2oz. If there’s anything specific you’d like me to mention then please leave a comment below and il update.